Last week I was a guest keynote facilitator at Econous2017, the annual gathering of Canadian community economic development practitioners. 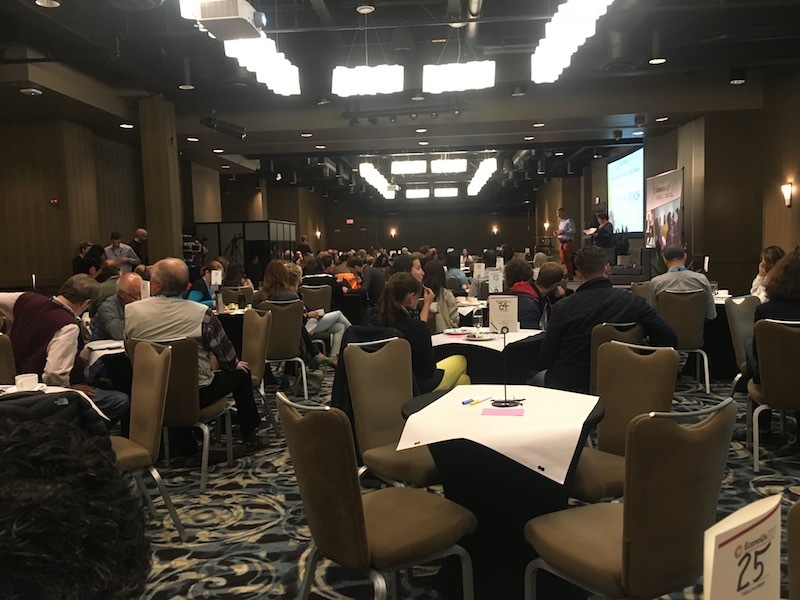 In all, 450 people from across the country gathered together in a traditional conference of panels, workshops and tours to learn and develop their own practices of social entrepreneurship, community development, planning and research. The conference organizers, led by the courageous Barb Davies of Momentum Consulting were resolved to make at least part of the conference a participatory plenary. The idea was to put the intelligence of the network to use and to ground and apply the learning and experiences of the previous three days on actual projects. We secured 250 small tables that only seated four, which is essential for doing participatory work in a conference setting. Rounds of 6, 8 or 10 people are useless as people cannot hear each other and they are seated too far apart. The inimitable Avril Orloff designed some templates for us and Matt Mayer and Brenna Atnikov were on hand to help hold space and to be good sounding boards for design and harvesting ideas. Team, tools, physical set up all in place. We had a plan. Pro Action Cafe is a method that was invented by Rainer von Leoprechting and Ria Baeck in Brussels in the early 2000s. It is now a core method in Art of Hosting trainings worldwide, as it is a brilliant combination of the self-organizing nature of an Open Space Technology meeting with the constraints of time, space and questions of a World Cafe. You can learn more about the core method by watching a short video or by downloading a user-guide to the process. While there is lots of scope for variation, the basic flow of questions: from need and purpose, through to what’s missing, to next steps, are as simple a planning framework as one can imagine. I’ve used the process in groups as big as 120, so 300 was going to be a new challenge. For the conference we needed to customize the process in our planning and in real time. The initial idea was to have participants at the conference post project topics all week long on a long clothesline outside the plenary room. This was intended to save time, as having 80 or more projects hosts identify and name their projects in a plenary room would be massively time consuming and boring. It quickly became very clear to me that everyone had a very different idea of what that clothesline was, and soon it became filled with information about things people were doing in addition to projects that people were working on. It was a cool news wall, but it wasn’t serving our function of being an emerging agenda wall for the final day’s plenary session. This meant that we had to adjust our work on the fly. One important lesson for keynote facilitators when working with a conference is never expect people to remember instructions. When you are working with a group of people who are moving in 400 different directions, they can only respond together to directions for the next thing to do. Give them one instruction at a time. Conferences are bubbly and chaotic and participants are there for individual learning. Group activities need to take place within a well managed but not overly controlled container. Everyone move to a table of four. Anyone who posted a project on the clothesline who wants to work on it, retrieve it from the front and return to your table and sit down. Once every table had a host, participants had two minutes to cruise the room and find a group to work with. We then proceeded through a normal Pro-Action cafe. This wasn’t a 100% ideal situation, as there may have been more than one person at a group of four that wanted to champion a project, but when you are working with a group of 300 people in an on the fly design, you simply can’t accommodate a very nuanced approach to individual desires. At any rate, there were no complaints at the end of the morning that people didn’t get to champion a project. One quarter of the room got to bring projects into the space and everyone else fulfilled the role of listeners and advisors. I let people find the projects they wanted to work on, but only a maximum of three advisers could join any round. I also encouraged people to just randomly sit at a table and offer a naive perspective to the work, one which can be very valuable. We had a number of really interesting projects emerge on the day covering the full spectrum of community economic development from food production to access to capital for entrepreneurs to community renewable energy models to creating labyrinths in a city. Participants left with filled in templates that captured their need and purpose, new ideas to improve the project and a list of resources and people that might help them move forward. It takes attention and a small team, but creating participatory and productive sessions in large conferences is possible. It means disrupting traditional conference organizing and conference hosting, but the upside is that participants get to work with the people in the room, get to exert agency over their learning agendas and everyone gets a chance to participate. I can’t overestimate how important it is work with good physical space set ups and to build in more time than you think you need in order for participants to not be rushed. Moving three hundred people around a room is a lot of work, and the herd moves slowly! Keynote facilitation is something I have done lost of in the past ten years. I’d be happy to chat with you about making your next conference more interactive and truly participatory beyond accepting questions to a panel from the floor, or having people tweet on a back channel to be engaged. Pro Action Cafe might just be the perfect tool to bring a conference to action in a short period of time and put the inspiration and learning to work. "It rains in the forest long after the sky has cleared"
Thank you, Chris. Really appreciate you sharing your experience. We are making haste slowly!